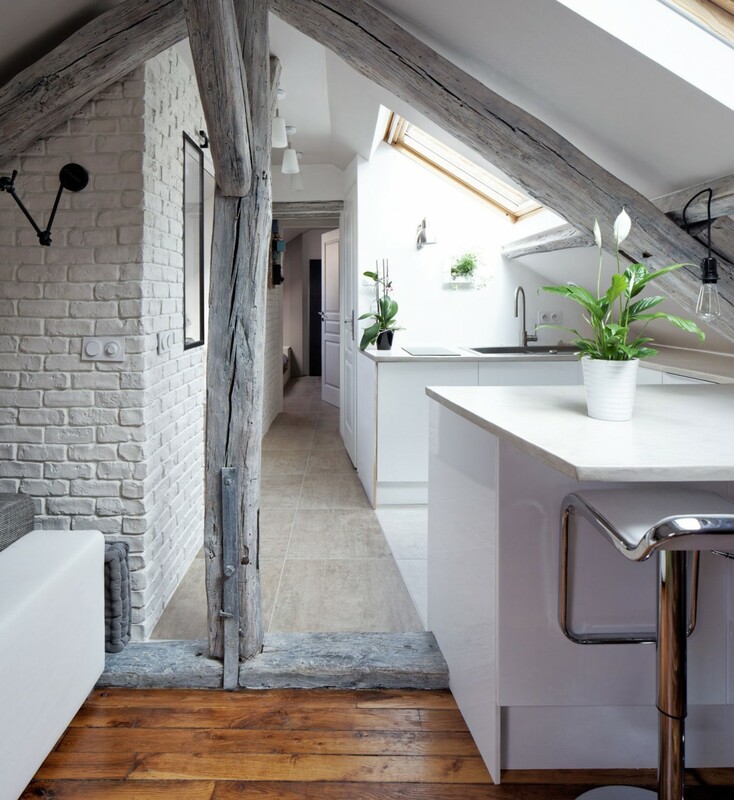 So that a tunnel effect was avoided the kitchen was planned so that the space would open physically as well as optically. 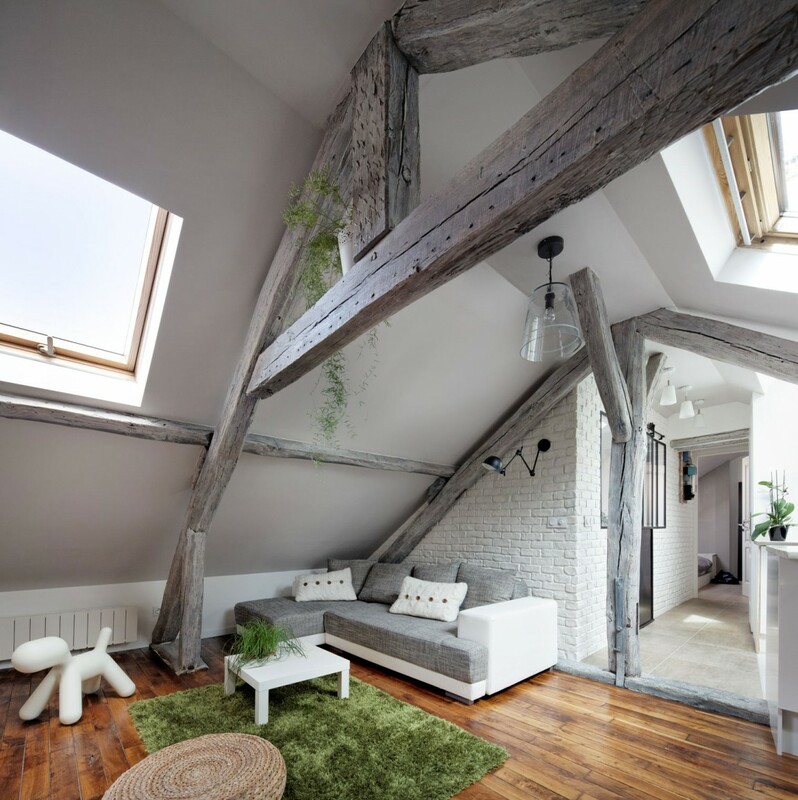 Recently my attention is attracted by the interiors from France. 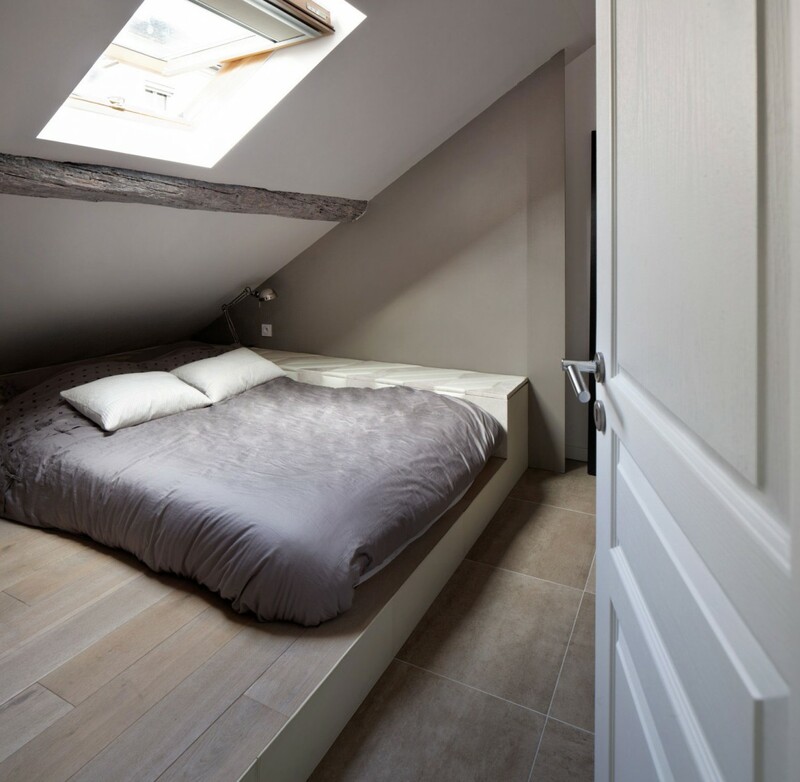 This one is not an exception but indeed exceptional by its space – it‘s an attic that was of a rather bad condition, therefore, a renovation sorted it out. 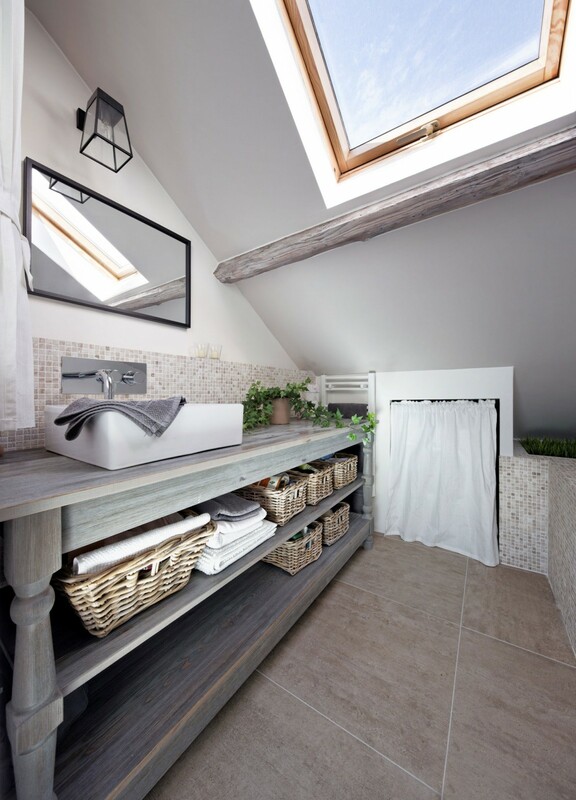 Probably there‘re no doubts that it‘s really difficult to plan spaces in attics due to a sloped ceiling. 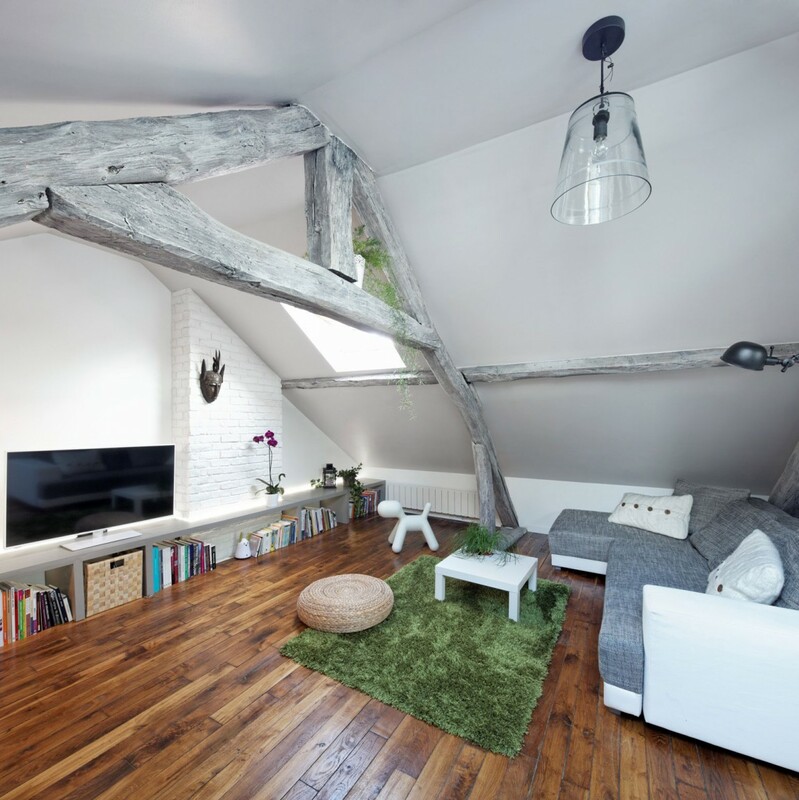 This fact usually limits functional furniture arrangement, as the heighest pieces of furniture must be planned more in the middle of a space than closer to the walls as usual. 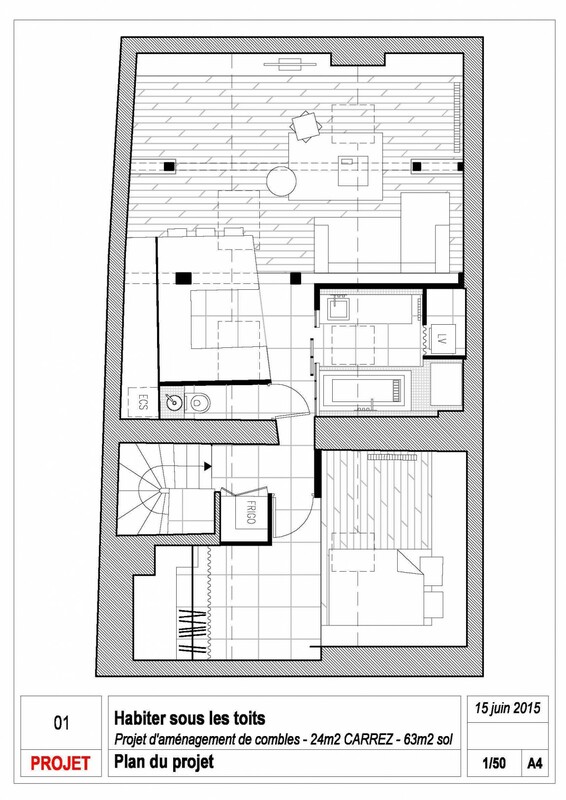 When you look through this 63 sq.m apartment plan it‘s not difficult to see that a dining room, kitchen and a bathroom are as if they are separated from the remaining part where a bedroom and wardrobe are planned. I don‘t know if it was not possible to fit a fridge into the space where it should belong (in a kitchen), as right now it‘s next to the entrance and I doubt a lot if it‘s indeed very comfortable – well, maybe it‘s comfortable if one does not cook so much in a kitchen. 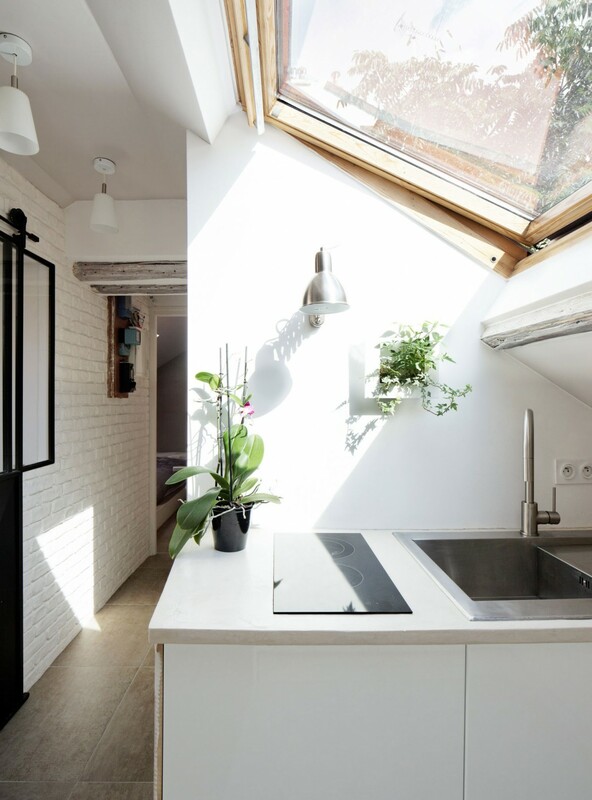 So that a tunnel effect was avoided the kitchen was planned so that the space would open physically as well as optically and it‘s clearly seen in a plan. 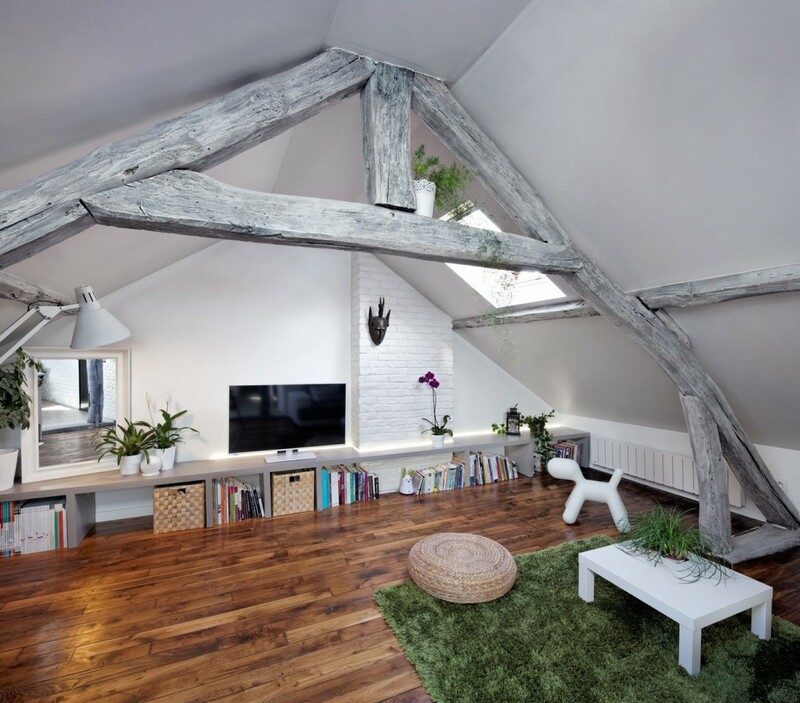 A living room looks conditionally spacy and that‘s no wonder why the height of ceiling is big as well as skylights through which a natural daylight penetrates and it gives its own pluses. 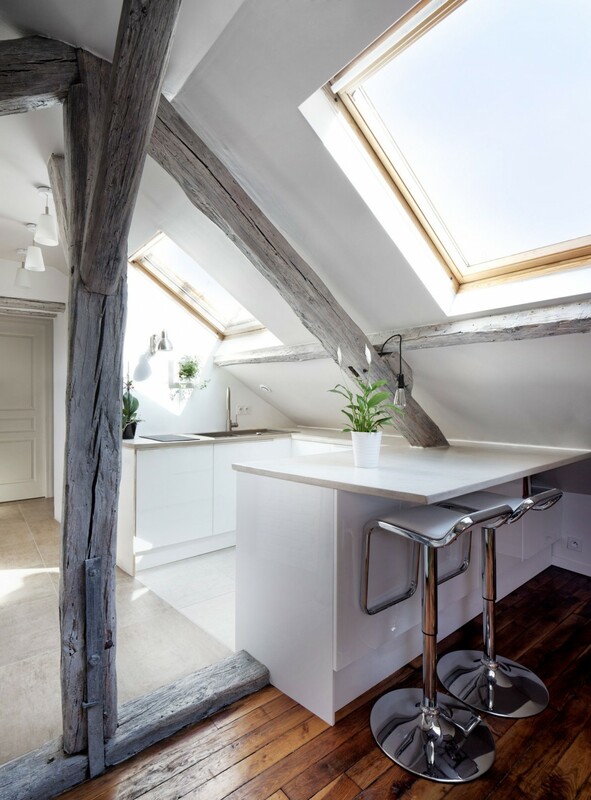 Wooden beams look especially nice as well as roof supports. It‘d hardly been possible to reach such an interior which is very nice for one‘s eye without them. 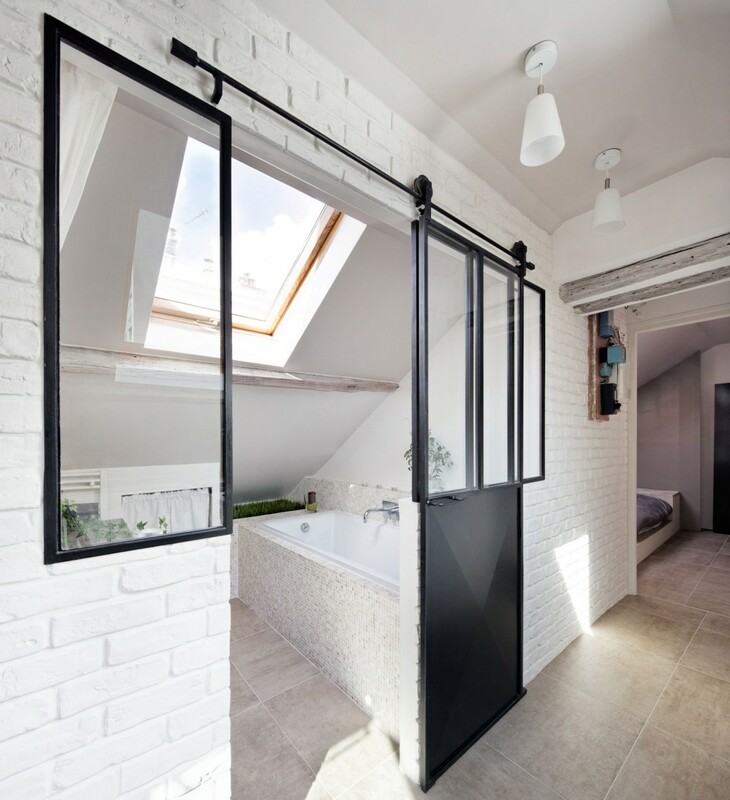 A common interior stylistics is remained in a bathroom – a natural wood, wicker baskets, small mosaic bricks and flora created an indeed warm premise impression. 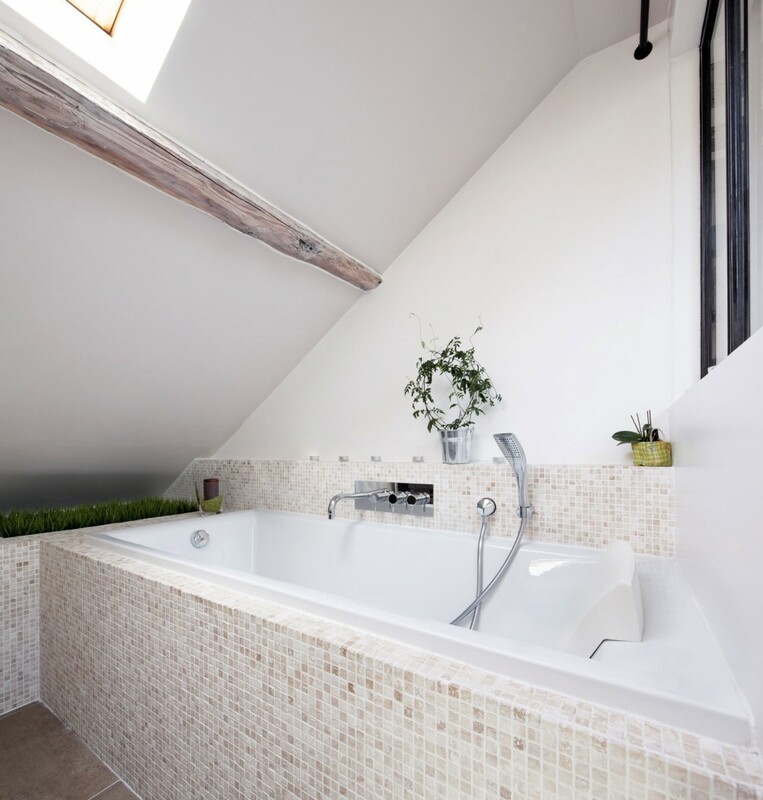 If you wish a lot to see how this attic looked before a rennovation, please see here.